job fair! That's pretty good!!! (The author of What Color Is Your Parachute? used to say that job fairs only resulted in a 1-2% chance of landing a job. 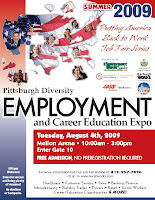 But I got my last job shortly after attending a job fair at Rostraver Ice Garden in October 2008!!! (StaffMasters in Southpointe) which led to me being hired on by the employer. This job fair news gives me renewed hope that once again I will find a half-decent job again hopefully soon! Amen! Praise God!